From enhanced self-awareness to greater flexibility and alternative treatment for depression, yoga has been gaining popularity with its long list of benefits. It certainly goes beyond those beautiful lululemon pants, even if we cannot resist them! Whether you are already part of the great yoga movement or you are trying to get into the scene, here are 5 simple poses (so easy anyone can do it!) to get you started at home! Breathe in, breathe out… our breath reveals a lot about our current state even though many of us can be oblivious to this fact. When we are feeling uncomfortable, stressed or angry, our breathing may become shallow. When we are relaxed, our breathing slows. You may be wondering what this has to do with yoga. Well, don’t you know yoga can be as simple as breathing? Forget about those challenging headstand and seemingly awkward poses! Breathing is used as meditation in yoga and it’s one of the fundamental practices. Depending on your purpose, there are different breathing exercises to practise. If you are not sure where to get started, check out our highly recommended mobile apps, ‘Calm’ or ‘Stop, breath, think’. Breathing is also used to transit between poses in yoga. So, first thing first, learn how to breathe right. Tip: Don’t miss our three recommended yoga apps at the end of the article, read on! Stand with your heels slightly apart and big toes touching. Lift your toes and spread them wide. Plant your feet firmly on the ground and feel the flow. Then, focus on your back and thighs, engaging the quadriceps. Draw your energy towards the midline of your body and stay in position for 30 seconds to 1 minute. Continue to breathe easy. To ensure that you are doing this right, you can align your back against the wall. Stand with your heels and shoulder blades touching the wall (but not the back of your head). On the surface, it may look as if you are just standing. However, did you know that this basic pose will use every muscle in your body when executed correctly? The mountain pose sets the foundation for all standing poses. Do it well, and you shall be able to improve your posture, balance and peace of mind. It’s kind of like getting the right home insurance. Choose wisely, and get the right protection for greater peace of mind. From the Mountain Pose, you may want to move on to the Tree Pose. Lift a leg while you balance on the other, which should be firmly planted on the ground. With both hands clasped at the front of your chest, breathe in and out deeply and slowly. This is another basic yoga positions that looks simple but could be physically challenging when executed correctly. The good news is the Tree Pose will help you to find balance, not just physically but mentally. Bear in mind, “No pain, no gain; nothing ventured, nothing gained”, unless it’s eEasy Save! The term ‘upside down’ tends to have a negative connotation, which explains why inversion are often feared by yoga beginners. However, ‘upside down’ may not be all bad or challenging. A different perspective can promote an open mind, which may bring forth endless opportunities… … just like how switching a new home insurer can benefit you. There are various inverted positions, but to begin with, you can simply lie on your back and put your feet against the wall! As blood flows to your head, throat and neck, the nerves centres in your brain, pituitary glands, and your thyroid gland shall be stimulated. In fact, some people believe that this pose can help maintain youthfulness. If you are feeling adventurous, you can also try the shoulder stand or headstand! Last but not least, end your short yoga session with the supine twisting posture. This is a favourite posture amongst many, as it helps to stretch all your muscles along the spine while one breathes slowly. Lie on your back, and bend one knee and cross it over the other while keeping both shoulders squared and rooted to the ground. You may apply slight pressure on the bent knee and feel the stretch. Continue the same on the other side. Supine twist poses are effective for reducing neck and back aches. Most importantly, it is recognised as a yoga remedy for poor digestion – a common ailment amongst office workers. Tried and proven effective, this is one of our favourite poses! Three recommended yoga apps that we love! A final note… … Before you get started, think about why you want to practise yoga. Understanding the purpose will help you to identify the relevant yoga poses that can address your needs. For example, certain body aches may alert and motivate you to improve your flexibility. In other cases, yoga can be a great meditative and restorative exercise to keep you sane, just like how the right home insurance can help to lessen worries in the event of a home emergency such as a broken pipe or fire accident. 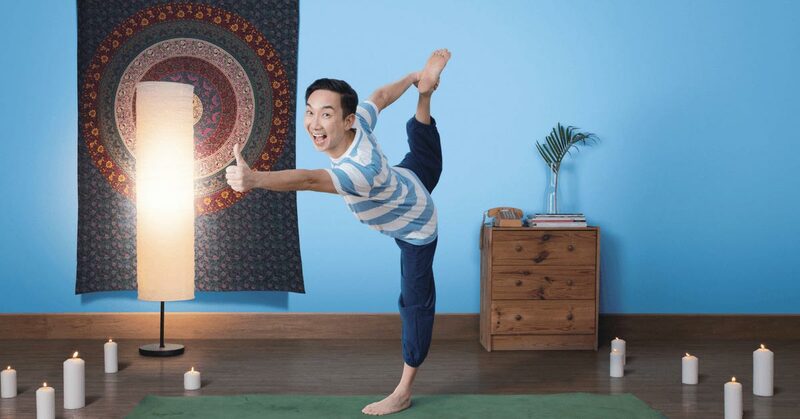 What does yoga has to do with Tiq Home Insurance? Both are flexible, reassuring and give you peace of mind, with great benefits in the long run.